Samsung seems to have started rolling out the Nougat update for its J-series devices. Recently, the company rolled out the Nougat Update for Galaxy J7 2016 in India. Now, the users of the Samsung Galaxy J7 Prime as receiving the Nougat Update, finally. 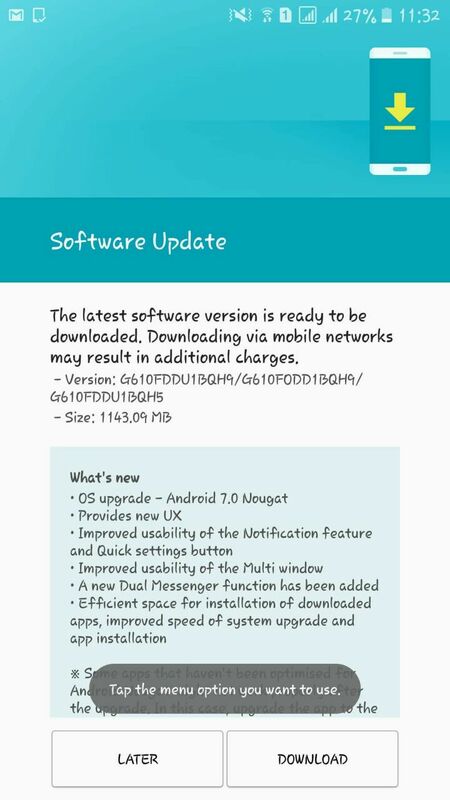 This new update brings the Android Nougat version 7.0 to the phone and comes with the firmware version G610FDDU1BQH9. If you haven’t yet received the notification for this Galaxy J7 Prime Nougat Update, then head over to the Settings and then go to the About Phone section to check for the software updates. This is an OTA update so it might take a day or two to come to your device. Have you got this update? Do let us know what changes did you notice in your phone’s performance.